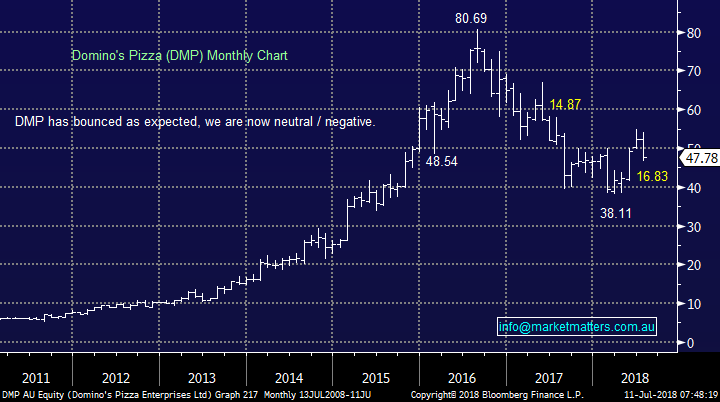 Even after its aggressive 2-year decline Domino’s (DMP) is still trading on a relatively expensive 30.6x valuation based on 2018 earnings while yielding just over 2% part franked. However DMP plans to over double its number of stores before 2025 theoretically significantly growing profits along the way by both the volume increase and technology improvements. Conversely the large issue of their franchise model remains – it seems the “small man” franchise owner the majority of the risk. Both fundamentally and technically MM does not like the risk / reward of DMP at current levels, the $30-$35 area will be interesting. 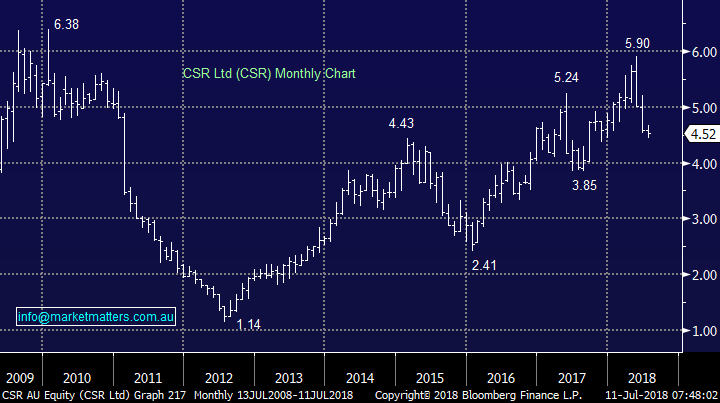 CSR has had a pretty wild ride in 2018, first rallying over 20% only to then give most of it back since mid-May. CSR has benefitted from the robust residential housing construction market but we question whether the building products supplier / manufacturer can rely on the tailwind over the next few years and some investors clearly agree. The stock is now trading on a conservative 11.8x valuation for 2018 while yielding almost 6% part franked. Overall this is not a sector we like and within it we prefer Boral (BLD) to CSR given its US exposure. 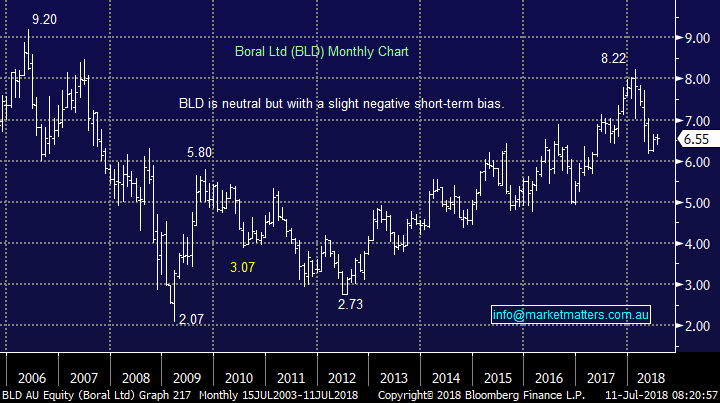 We are neutral / bearish CSR targeting ~$4 while Boral (BLD) will look interesting under $6. 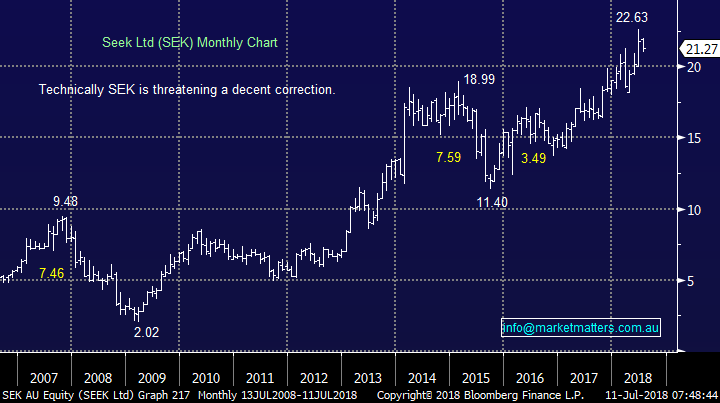 Time for a large contrarian call – we believe SEK is a sell on a risk / reward basis! The online employment platform has enjoyed a great decade but while its long-term growth potential is undeniable we feel it’s got ahead of itself in a market that has chased many tech shares significantly higher without due concern to the risk / reward. SEK is currently trading on a valuation of 35x 2018 earnings while yielding just over 2% fully franked. We are bearish SEK initially targeting a break towards $19 support, or 10% lower. We are net bearish Domino’s (DMP), CSR Ltd (CSR) and Seek (SEK) in the second half of 2018 until further notice.